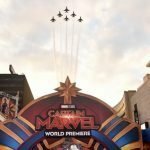 The US military, particularly the Air Force, invested a lot of time and resources in helping make Captain Marvel, and so far they are happy with the return on that investment. 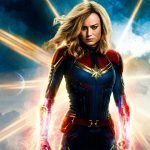 Yesterday, an article on Military.com celebrated Captain Marvel as ‘the film girls need’ and ‘one the military community needs’. But it hasn’t been long since the military were actively objecting to scenes in movies depicting women taking an active role in military service. 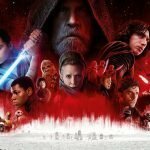 The piece of journalistic schlock goes on to contradict itself, saying 50% of women have never even considered joining the military, and claiming that box office receipts somehow prove that women want to serve. 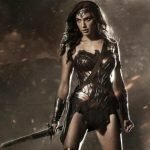 The notion that women paid to see the movie because they wanted to see a female-led superhero movie, or just wanted to see a superhero movie, seems to have escaped the author. Instead, the entire piece is about how the film relates to recruitment efforts and celebrates women in the armed forces. Oh, and it claims that the film ‘fills a gap’ because ‘everyone deserves to be told they can be a superhero’. Even though, in reality, none of us can actually be superheroes. Yet more hyperreal insanity resulting from the Marvel Cinematic Universe. 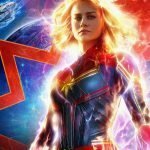 This is literally the worst article I’ve read on Captain Marvel, and there have been quite a few. 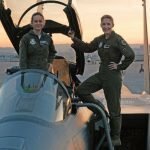 Slipped into one paragraph is a crucial fact – that women have only been able to fly combat missions since 1993. 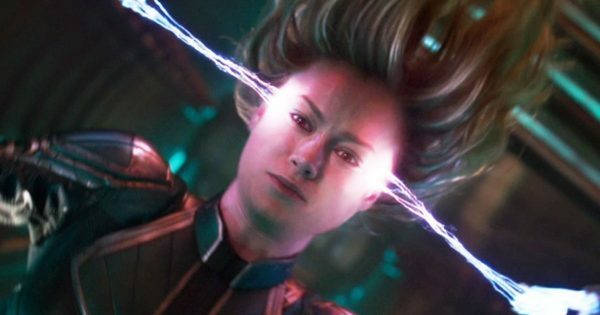 Prior to that they could do test flights (as Brie Larson’s character is shown doing in the movie) but couldn’t actually fly alongside their male counterparts. But who cares about sexism when ‘everyone deserves to be told they can be a superhero’? 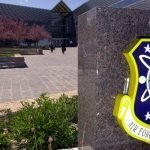 Adding to the irony and hypocrisy, the Pentagon’s entertainment liaison offices used to be very careful around the issue of women in the military. For example on Firebirds a.k.a. Wings of the Apache (1990) the Army had some problems with the character of Terry – a female Army pilot. In particular they didn’t like her referring to ‘her career’ and insisted the script include lines where she expresses her desire to be ‘part of the team’. 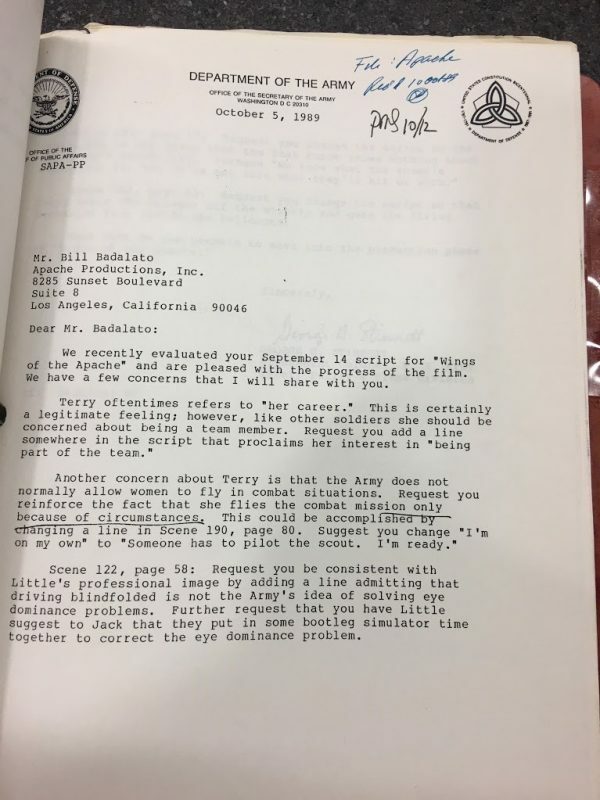 Also, she flies a combat mission during the film – unlike real women in the real Army at the time – so the Army told the producer to add in a line making it clear she was only flying the mission due to circumstances. 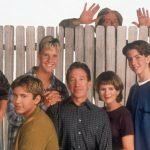 Similarly, on the episode of Home Improvement titled ‘Tanks for the Memories’ Tim and his wife Jill visit a Marine Corps base and get to drive some tanks on the training track, with Jill proving much more adept at maneuvering the vehicle than Tim. Afterwards, in the canteen, the original script had a Marine officer saying ‘maybe all our tanks drivers should be women’. 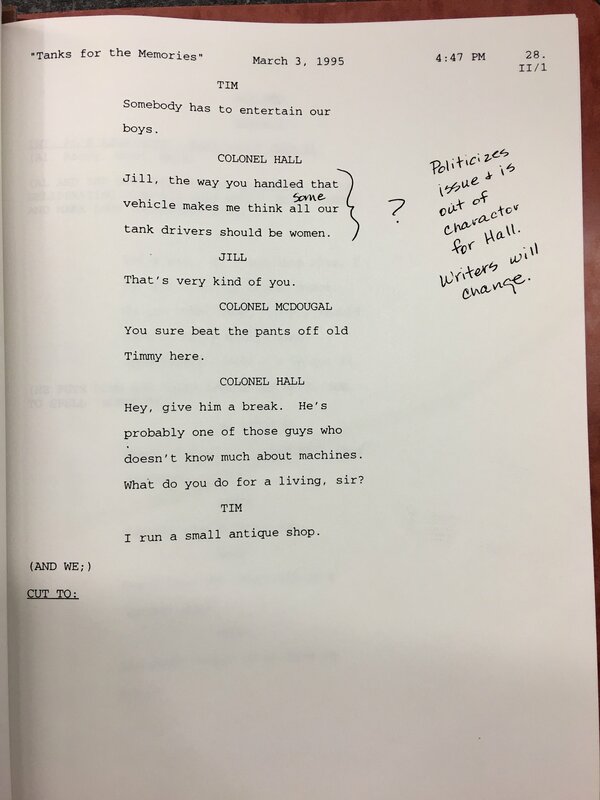 A handwritten note on the draft script says that this ‘politicizes the issue’ and that ‘writers will change’. In the finished episode this dialogue does not appear.